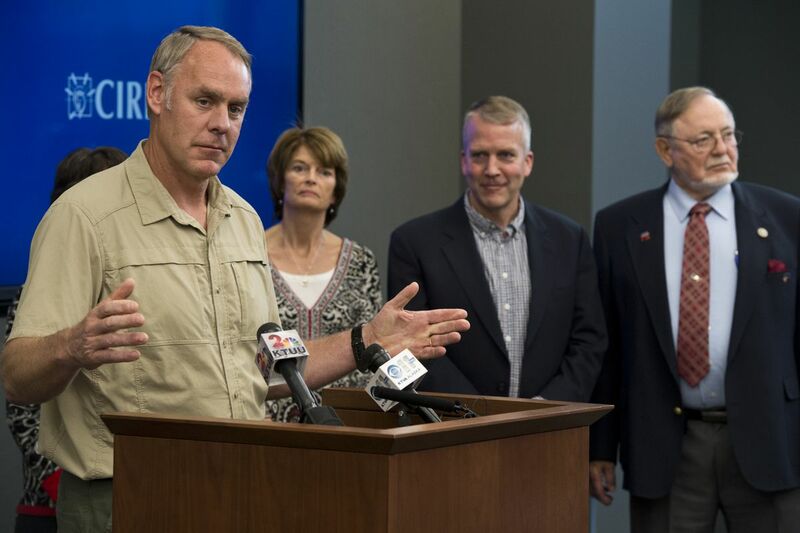 As his whirlwind tour of Alaska begins winding down, the nation's new interior secretary said on Tuesday he would work to give Alaska Natives more opportunities to take over wildlife management and other federal responsibilities. Ryan Zinke said the Interior Department needs to look at more opportunities to "get government out of the way" and give Alaska Native villages more input into federal decisions affecting their communities. "Why can't we allow villages to manage their destiny?" he said to reporters, following a 1 1/2 hour round-table meeting with more than 40 Alaska Native leaders. The event was organized by the Alaska Federation of Natives on day four of Zinke's Alaska adventure, a trip that included a hike in Denali National Park and a visit to the North Slope oil fields and the controversial and potentially oil-rich Arctic National Wildlife Refuge. On Tuesday, Zinke also expressed support for streamlining permitting decisions to put more oil in the 800-mile trans-Alaska pipeline, without relaxing government accountability. Asked about climate change that the burning of oil and gas contribute to, he promised to work closely with Alaska Native communities fighting the effects of warmer temperatures. Zinke's predecessor, Sally Jewell, enjoyed strong support by Alaska Natives, in part because of her efforts to highlight the problems of climate change in rural communities and the Obama administration's unprecedented effort to engage Natives. Zinke, appointed by President Donald Trump, said there's a lot of anger in America and Alaska over the Interior Department's "deaf ear." He said he heard strong support for resource development during the AFN meeting. AFN's key goal was highlighting how Alaska Native corporations can partner with the federal government to help pull Alaska out of its economic recession, said Julie Kitka, AFN president. "We believe we can make government resources go further," said Kitka. A key concept is allowing Alaska Native organizations to carry out some of the work currently done by the federal government, in a manner similar to the success Native groups have had delivering health care across Alaska with money from the Indian Health Service. The afternoon event was held in the Anchorage headquarters of CIRI, the Alaska Native corporation for the region. Earlier Tuesday, Zinke spoke with Alaska Native veterans in a meeting organized by Alaska Sen. Dan Sullivan. Zinke said he supports a Sullivan-sponsored bill to provide government-promised land allotments to about 2,800 Alaska Natives who didn't apply for them during the Native land rights movement because they were serving in the Vietnam War. In a statement issued by Sullivan, Zinke said that "Alaska Native warriors" serve in the military at higher rates than all other groups. A former Navy SEAL, Zinke committed to working with Alaska's delegation to see the issue resolved. The Interior Department is critical in Alaska, where the federal government owns close to two-thirds of the land. The agency spent more than $341 million in the state in fiscal year 2016, and oversees the National Park Service, the Bureau of Land Management and the Bureau of Indian Affairs. Sen. Lisa Murkowski, chair of the Energy and Natural Resources Committee, organized Zinke's visit. Also visiting the state were a handful of senators, including majority whip John Cornyn, R-Texas. Zinke's nearly weeklong Alaska leg followed stops in Norway and Greenland. He touched down in the state on Saturday, and visited the decades-old fields at Prudhoe Bay and new activity in the National Petroleum Reserve-Alaska. It was a chance to witness the improved efficiency of oil production, with long-distance drilling today dramatically reducing the impact to tundra by reaching more of the reservoir from smaller drill sites, Murkowski said in a statement. The group also flew over the 19 million-acre ANWR, which President Donald Trump has proposed opening, to the alarm of conservation groups. On Tuesday afternoon, Zinke looked like a park ranger in a khaki shirt and green cargo pants. He said he'd hiked at Denali National Park and Preserve over the holiday weekend. On Sunday, he visited Denali State Park for a Memorial Day ceremony with veterans, after getting a two-wheeled ride from the Alaska Vets Motorcycle Club. Zinke told reporters following the AFN event that federal leasing income from offshore oil activity has fallen by many billions of dollars as the oil industry lost trust in the Obama administration. Zinke said he wants to restore that trust and that he would seek to ease "arbitrary" permitting hurdles to help boost North Slope oil production that is one-fourth its numbers in the late 1980s. On Wednesday, Zinke is scheduled to comment on energy development as the keynote speaker at the Alaska Oil and Gas Association conference. He is set to speak at 12:15 p.m. in the Dena'ina Civic and Convention Center.